Home/Featured/To Trade or Not to Trade Ondrej Pavelec? Trade deadline is just a few months away, and with Ondrej Pavelec still on injured reserve, the goaltending situation needs to be figured out soon. Since his first NHL game, Connor Hellebuyck is 11-7-1 and has recorded one shutout. Hellebuyck is currently 3rd in the league for save percentage ( .932%) and goals against average (2.00). 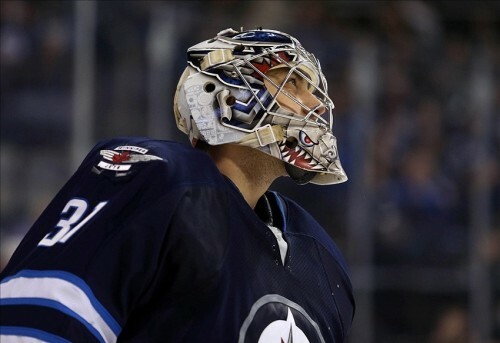 The Jets need to utilize the time until the deadline to work out a trade for Pavelec. The depth on the Jets roster is lacking, and a blockbuster trade involving Byfuglien and Pavelec could make a world of difference in the dynamic of the team. Michael Hutchinson hasn’t had the best season. In his 17 games played this season, he is 5-9-1 with a .904 save percentage and 2.97 goals against average. Prior to Pavelec’s injury, he played 15 games with a 5-6-1 record, .906 save percentage and 2.82 goals against average. Pavelec has not appeared in a game since November 21 against Arizona, after suffering an injury from a collision that resulted in goaltender interference. Regardless of when Pavelec will return, Hellebuyck should take over the starting slot. Pavelec has been the starting goaltender since the 2010-2011 season with the Atlanta Thrashers. Technically, they could carry three goalies and send Hutchinson down to the Manitoba Moose, however, it’s a much smarter option to trade Pavelec. Pavelec may be the best goalie in the Atlanta/Winnipeg franchise, relatively speaking, but how much is that worth? There have been comments that he’s just good in comparison to the team’s playing for. In 2012, he was signed to a 5-year, $19.5 million dollar contract, but he clearly isn’t worth the $3.9 million annual cap hit. Eliminating Pavelec gives Hellebuyck the chance to be the starter for the whole season and leaves Hutchinson as the back up goalie. There is potential to build a future around Hellebuyck. Pavelec is a good goalie, but while he’s still worth something, the Jets need to take advantage of that and think about the future of the team. The roster is relatively unchanged since the relocation from Atlanta. The Jets need to use Pavelec as a bargaining piece for a defenseman and and draft pick. They could also tie in Byfuglien to get more of a powerhouse player that will work better with the defensemen they already have. There is always the option of revisiting bringing Travis Hamonic on board, he would be an excellent addition. There are a few players that would be ideal candidates for trades. Between Hellebuyck and Hutchinson, the goaltending is covered. As far as stats are concerned, Kevin Shattenkirk would be a great fit on the team. Shattenkirk has 27 points with the Blues (9G, 18A.) He’s not the most productive defenseman, and he currently has a -8 rating, he would pair well with both Tyler Myers and Toby Enstrom based on skill. Another good option for trades is Cam Fowler, his cap hit is closer to Dustin Byfuglien’s($5.2 million) and he isn’t producing well in Anaheim. This season has been his least productive with 3 goals and 9 assists. In past seasons, he’s been more useful, but with current stats, there’s a chance that both Fowler and Anaheim are looking to change it up. Fowler has great offensive skills and can fill the spot of Byfuglien if he leaves the Jets. Regardless of who stays and who goes, the Jets have a good opportunity to rebuild and revamp the roster before key contracts expire.